↑ IEC 60050 (Publication date: 1990-10). Section 411-31: Rotation Machinery - General, IEV ref. 411-31-10: "Induction Machine - an asynchronous machine of which only one winding is energized". ↑ 2.0 2.1 Alger, Philip L.; et al. (1949). "'Induction Machines' sub-section of Sec. 7 - Alternating-Current Generators and Motors". In Knowlton, A.E. Standard Handbook for Electrical Engineers (8th ed.). McGraw-Hill. p. 705. ↑ "AC Motors". NSW HSC Online - Charles Sturt University. Retrieved 2 December 2012. ↑ NEMA MG-1 2007 Condensed (2008). Information Guide for General Purpose Industrial AC Small and Medium Squirrel-Cage Induction Motor Standards. Rosslyn, Virginia US: NEMA. p. 29 (Table 11). Retrieved 2 December 2012. 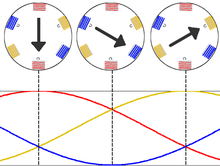 ↑ "Induction (Asynchronous) Motors" (PDF). Mississippi State University Dept of Electrical and Computer Engineering, Course ECE 3183, 'Electrical Engineering Systems for non-ECE majors'. Archived from the original (PDF) on 15 May 2016. Retrieved 2 December 2012. ↑ "Induction Motors". electricmotors.machinedesign.com. Penton Media, Inc. Archived from the original on 2007-11-16. Retrieved 2016-04-12. ↑ "Motor Formulas". elec-toolbox.com. Archived from the original on 8 May 1999. Retrieved 1 January 2013. ↑ NEMA Standards Publication (2007). Application Guide for AC Adjustable Speed Drive Systems. Rosslyn, Virginia US: NEMA. p. 6. Archived from the original on 28 April 2008. Retrieved 2 December 2012. ↑ Herman, Stephen L. (2011). Alternating Current Fundamentals (8th ed.). US: Cengage Learning. pp. 529–536. ISBN 1-111-03913-5. ↑ 11.0 11.1 Peltola, Mauri. 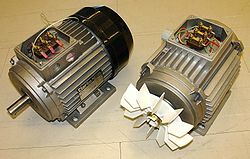 "AC Induction Motor Slip". Plantservices.com. Retrieved 18 December 2012.